Wisconsin Aviation's Madison FBO is a designated "Gateway FBO" for flights into Ronald Reagan National Airport (DCA), Washington, D.C. This designation allows for a much easier planning process for those flying into DCA from MSN. Have threat assessments conducted by TSA on their flight crewmembers and passengers. Carry a TSA-approved, armed security officer on the flight. Have the TSA inspect the aircraft and screen the passengers, their carry-on property, and property carried in the cargo hold of the aircraft before departure. Make the flight's last point of departure from a fixed-base operator approved by the TSA as a "gateway airport." Why do we have to go through a gateway FBO? TSA requires that passengers on flights to or from DCA have to be screened by TSA security screeners. The security screening is the same as that required for passengers on commercial airlines and generally takes only a few minutes. TSA also requires that aircraft and crew that fly to or from DCA without passengers (for instance, repositioning flights) have to be screened by TSA personnel. Only specific airports ("gateway airports") are equipped to accommodate this screening process. Only these airports have been approved by TSA as gateway airports for flights to DCA. Currently, there are 67 such airports (see map below). All flights to DCA have to proceed via one of these gateway airports. 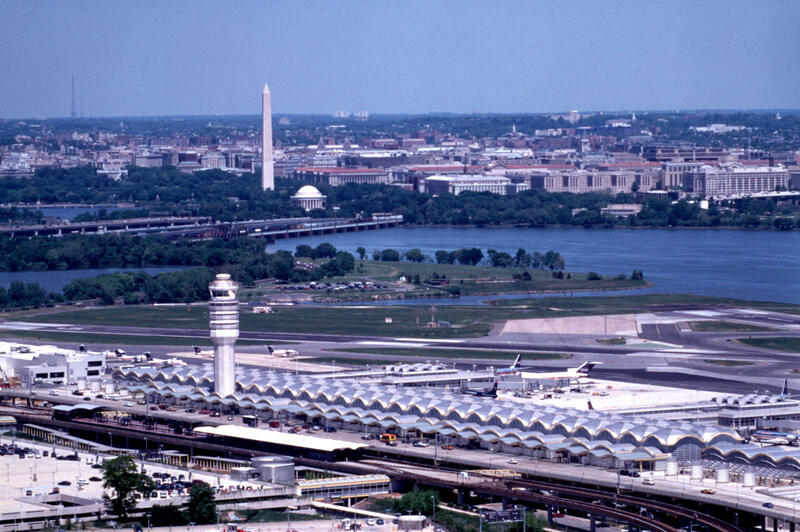 Flights from DCA can proceed directly to any airport. For instance, if you plan a trip from Washington, DC, to Boston-Bedford's Hanscom airport (BED), operating the flight from and to DCA is an ideal solution, since we do not have to stop at a gateway airport that is not on your planned route of flight. You simply board the airplane at DCA for your outbound flight, and the same is true for your return flight to DCA. If you plan a trip from Washington, DC, to an airport that is not a gateway, DCA can still be a component of an optimal travel plan. We simply pick you up at DCA and fly you to your destination. In this case, for the return flight, we suggest that we fly to Dulles, or another surrounding airport in the Washington, DC, area. We can still fly you to DCA on the return flight, but that would involve stopping at a gateway airport to clear security, and we feel that this might delay your flight unnecessarily. We also do not require you to "check in" early for your flight as you would have to with an airline. As for all our flights, we will depart as soon as you get to the airport. However, we do ask that you please not be late for DCA flights. Although TSA will attempt to accommodate changes to departure times, TSA may not be able to accommodate every rescheduling of the departure time, depending on the availability of TSA screeners at the new requested departure time. Your carry-on baggage on DCA flights is subject to the same security restrictions as it would be for any other Wisconsin Aviation flight. Please note that those security restrictions are not as limiting as the list of prohibited items used by the airlines. For instance, your carry-on baggage may not contain items that may be used as weapons, but it may contain liquids over 3 ounces. However, some prohibited items may simply be carried in your "checked" baggage. Checked baggage will be stored by the crew in an exterior baggage compartment to which you will not have access in flight. Depending on aircraft, the availability of exterior baggage compartment space may be limited. Your Wisconsin Aviation scheduler will be happy to help you make the right choices about prohibited items in your baggage. For the same reason that only specific "gateway" airports can accommodate the security measures required for DCA flights, there are only certain FBOs at each gateway airport that can accommodate these security measures. We have to submit an initial trip itinerary to TSA at least 24 hours before the flight's departure. TSA uses the information we provide about passengers, crew, and aircraft to conduct a security check. At TSA's discretion, we may be able to make changes to the departure times within the last 24 hours before the originally scheduled departure. However, within the last 24 hours before the flight's departure, we cannot add passengers to the itinerary, or change gateway or destination airports. However, we can delete passengers from the passenger manifest up to departure time of the flight. If you are not certain whether a passenger in your party will or will not be traveling with you, it is best to ask us to list that passenger on the manifest. We can always delete, but not add, names on the passenger manifest. Does your stop at a gateway before picking me up at DCA affect the crew's duty day? Since our crew has to reposition the aircraft to a gateway airport, where aircraft and crew can be security-screened by TSA, this reduces the crew's remaining available duty day. However, we may be able to reposition the aircraft to DCA on the day prior to your flight. In that case, you will have the crew's full duty day available for your trip. Why do you need an armed guard on board? I'm not a criminal. Wisconsin Aviation selects only highly-qualified and trained current or former law enforcement officers with a particular background in customer service and specific aviation experience as ASOs. Why wouldn't I just save myself the hassle and depart from Dulles instead? For some customers, choosing to fly out of Manassas or Dulles Airport might be a preferred option due to the potential cost savings. However, other clients may find DCA's close proximity to the nation's capital to be extremely important, which is why Wisconsin Aviation is pleased to have met the rigorous TSA requirements in order to offer this charter service to you. However, if you plan to leave from DCA before 6:30 am, or plan to return to DCA after 10 pm, we suggest that you use another airport, since operations at DCA are prohibited after 10 pm and before 6:30 am. Armed Security Officer (ASO) on board each flight. Click here for more information on the Armed Security Officer program. All DASSP flights must depart from an approved gateway airport and participating Fixed Base Operator (FBO). Click here to view the DASSP Gateway Airports and FBOs.